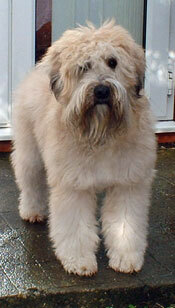 The Soft-Coated Wheaten Terrier comes from Ireland, where it served as an all-purpose farm dog. It performed duties for the peasant class of Ireland, such as herding, vermin hunting and watching livestock. These dogs needed to be intelligent with a size that balanced authority and expense. They are said to be relatives of the Kerry Blue Terrier. The origin tale of the Kerry Blue tell of little blue dogs that escaped from a sinking vessel of the Spanish Armada off the coast of Ireland. On the shore, wheaten-coated terriers awaited them and the rest was history. Soft-Coated Wheaten Terriers were first brought to the United States in the 1940s. They became popular in the 1960s, and have remained a so until today.